Into the Veg: Billed as the first vegetarian hotel restaurant in Hong Kong, VEDA is an all-new spot blending East and West in an all-day concept. Tucked into the new Ovolo Central hotel on Arbuthnot Road, VEDA is a fresh vego offering near meat-friendly SoHo and the drinking dens of Wyndham Street. Look & Feel: Designed by MAKE and KplusK Associates, the joint is simple yet eclectic. There’s a bar area for aperitifs (and digestifs, natch) and a separate dining room for sit-down meals. 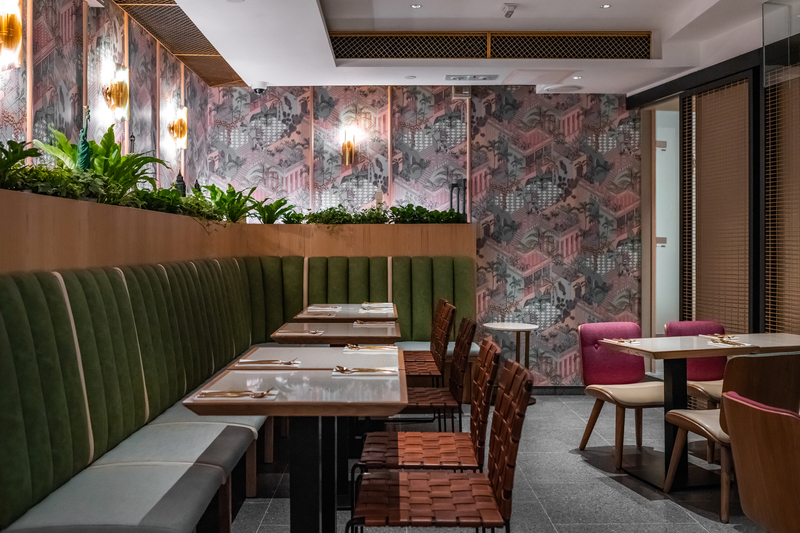 The space itself is unfussy, but heavily patterned wallpaper, seats in different colors and textures, and careful plant accents enliven the joint. It’s small, so it feels like you could be sitting in a friend’s house. On the Menu: VEDA is all veg, all the time, so if you’re a devoted meateater, you’re outta luck. Give it a go, though, because you might just become a convert to this well-crafted, flavorful dishes. The signature dishes are solid, particularly the Nepalese ricotta and spinach memos ($78). The baked aloo gobi (that would be cauliflower with potato and curry sauce, for the uninitiated, is available as a half ($78) or whole ($130) portion. 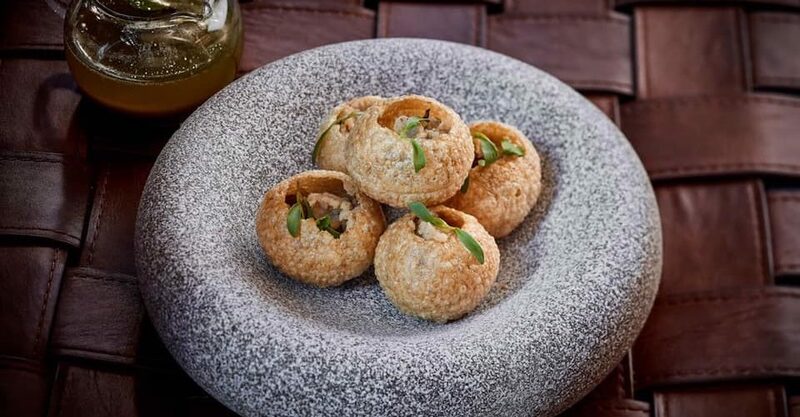 Meanwhile, the corn khinchdi with wild mushroom curry is a delicious two-for-one dish that will absolutely delight – and it’s also available as a small ($78) or large ($130) portion. Libations are equally well-thought-out. The drinks list includes an extensive selection of quality Australian wines, and a selection of innovative cocktails. Jeng: Most meat-eaters would balk at the idea of going to a full veg restaurant, but the food here is (mostly) so good that you won’t even miss your heavy dose of protein. Not so Jeng: This joint really is tiny, even by Hong Kong standards, so you’ll want to book a table or be prepared to wait (or perhaps sit at one of the low coffee-table-style set-ups upstairs. Meet the Chef: Australian-born Hetty McKinnon is best known for her Arthur Street Kitchen project. Though she’s based in New York, she’s lending her expertise to this Hong Kong menu. Great For: Vegetarians, vegans, and everyone in between — and for anyone looking to save the environment by lowering their meat consumption. FYI: In keeping with the quality Australian vibe, VEDA dishes up coffee by artisanal Australian roasters Pablo & Rusty’s. This writeup was based on a complimentary media tasting. The Loop HK doesn’t guarantee/sell restaurant review coverage. See our editorial policy here. Check out Hong Kong’s newest restaurants and bars here.